"When I decided to write a faux London gangster story..."
"A group of elves holding cans of Special Brew raced past, chased by a wheezing Santa Claus." "If Mad Mack was startled when he saw the shining barrel of a Glock 29 pointing straight at him through the lattice grid, he was certainly too shocked to react before Father Tim Cook muttered: `Sic transit Gloria friggin' Gaynor,' and blasted Mack's brains all over the confessional." "... it seemed the sensible thing to take a title from a song by The Clash, that most London of all London bands – even though only one of them was actually born ‘dahn The Smoke.’...And I had plenty of cracking titles to choose from and reject, too – London Calling (been done to death), London’s Burning (reminded me of the naff TV show about firemen), Guns On The Roof ( a silly song about when The Clash were told off for shooting pigeons with an air rifle), Somebody Got Murdered (too obscure), The Last Gang In Town (close, close …) Police & Thieves (Maybe …)"
Now, I was not alienated enough a suburban kid to have regarded the Clash as seminal avatars of anything, but I sure did read a lot or reverent tosh from the typewriters and word processors rock and roll "critics" in the late 1970s and early 1980s, so I love Brazill's irreverence. Any British author setting out to write a gangster story must confront the towering example of Ted Lewis. Lewis' three Jack Carter novels are dark, grim, and deadly serious, yet punctuated by grim, delightful humor. Few crime writers can manage that; Derek Raymond, who acknowledged Lewis' influence, is the only other example who comes immediately to mind. 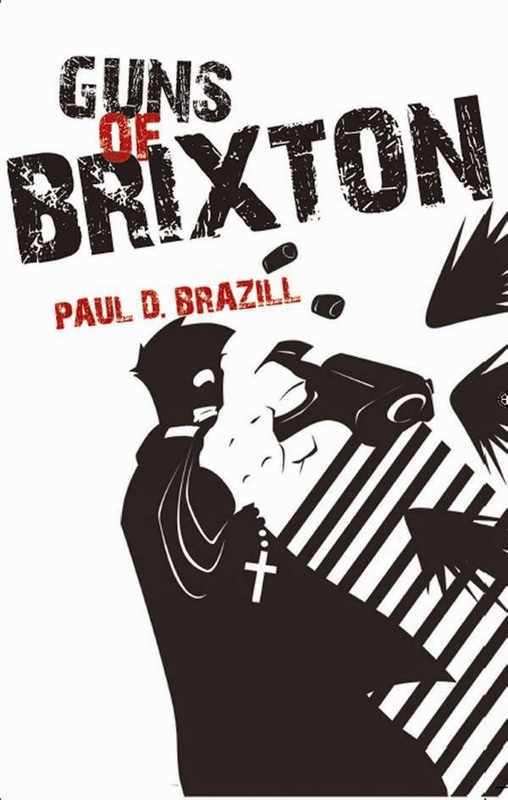 Guns of Brixton does the next best thing: It has tremendous fun with the form while at the same time acknowledging Lewis' fictional world both implicitly (in the novel's several gay or lesbian minor characters) and explicitly (a brief discussion of Michael Caine and the celebrated movie adaptation of Get Carter toward the novel's end). If you love Lewis and the movie, but find Guy Ritchie irritating, you might like Guns of Brixton. That would make a good bumper sticker: "I GOT GOB!" I hunted up some Clash clips after finishing the book. Joe Strummer's voice on "Redemption Songs" is jarring after Johnny Cash's. strummer should have gone first. Is the follow-up out yet? I'm still fiddling with it. Shoehorning in some more crap jokes. The first 2 Clash LPs are their best, for me. Why does all of this remind me of the Alec Guinness movie -- The Lavender Hill Mob? There may be no connection, but at least I am curious enough to read Brazil (and that notion is not PK induced). Nice one! I used to describe GOB as ' a sweary Ealing Comedy.' I'm a big fan of TLHM and The Ladykillers especially. I looked back at the review I wrote on this book awhile ago and found that I too went and picked out a funny bit. They are pretty irresistible. Seana: Paul also writes a good lowlife werewolf P/I. story. Oh, and get well soon, RT. I have it on my ereader, Peter, I just haven't had a chance to get around to it yet. Paul: I would have found the "sweary Ealing comedy" description hard to resist. Seana, I liked the finny bit you singled out. I was going to highlight that one, too, but I wanted this post to be more than just a string of bits. Yeah, ideally we quote just enough to whet readers' interest, and give them a sense of the style. And we try to avoid mere plot summaries. We leave that sort of thing for the newspapers. Humour is one of those things that rareley translates - even from person to person- so it's particularly nice when you septics get my yarns. Septics, you say? Hell, I even got all but one of GOB's uses of rhyming slang. Septics? This is just because I've been talking about sumps over at my place, isn't it? I do actually make up my own rhyming slang. Would you Adam and Steve it? Ah, you're full of grime and grit. In fact, you beat me to it. I had just signed on to post: "Unless you made up your own rhyming slang." Your examples have a touch of whimsey to them. Seana, no your discussion is sumping else entirely. You may know that Philadelphia's public transport agency is the Southeastern Pennsylvania Transportation Authority, known to all as SEPTA. I got quite a kick out of this when I first moved here.